What is Central Serous Choroidopathy? Central Serous Choroidopathy (CSC), also known as Central Serous Retinopathy (CSR), is a disease that causes fluid build-up beneath the retina. 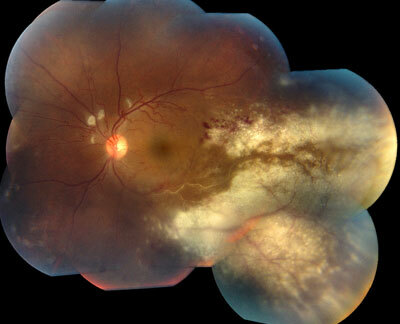 This leakage of fluid comes from the layers under the retina, the retinal pigment epithelium (RPE) and choroid. This condition generally affects a person’s central vision. Central serous can be diagnosed by examining the retina with special lenses allowing a view of the back of the eye. A blistering of the retina may be seen. Some cases are very subtle and additional testing is required. 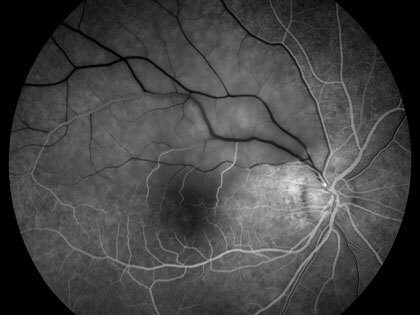 Fluorescein angiography will show a spot of leakage which, in some cases, might have accumulated into a classic “smoke-stack” pattern and may be used to identify complications including choroidal neovascularization. Indocyanine Green (ICG) angiography supports the role of the choroid in this disease and is rarely useful in management. We now use high-resolution optical coherence tomography (OCT) to identify fluid under the retina and to identify subtle cases that might otherwise be missed. Signs of central serous can include an elevation of the central retina (macula), deposits beneath the retina, dark and light color changes (hyper- and hypo-pigmentation), and, in complex cases, blood, fat deposits (lipid) and scarring (fibrosis). The “normal eye” often has subtle changes as well. Symptoms include blurred central vision, small image size (micropsia), and distortion of the image (metamorphosia). After central serous resolves, most patients will still have residual symptoms such as distortion, decreased color and contrast sensitivity, and vision difficulty at night. There is also a 40-50% change of recurrence over time. 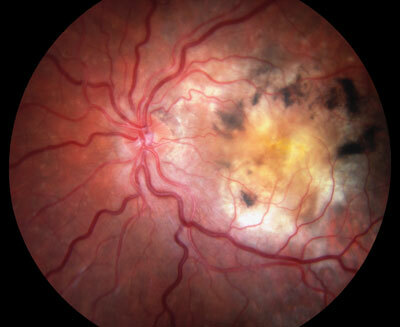 In some cases, the longterm complications may be due to residual chronic activity and a more detailed evaluation of the disease process may improve the visual results. While there is no known cure, treatment is directed at the underlying modifiable risk factors such as removal of stimulants from the diet (e.g., smoking, caffeine, energy drinks, steroids) and improved life style (e.g., more sleep = less stress). Normally this condition clears up in a month or two. In patients with more severe vision loss or a prolonged course of the disease, laser treatment has been shown to reduce the course of the disease and improve vision. In some complex cases, we may consider treatment with a “cold laser” (photodynamic therapy with Visudyne), intraocular injections of anti-VEGF drugs such as Avastin, or a combination of these treatments. Non-steroidal anti-inflammatory drugs (NSAIDS) have been shown, experimentally, to stimulate fluid absorption but have not been proven in a controlled clinical trial. The newest treatment options may improve outcomes and we specialize in the latest testing and treatments here at the Retina Macula Institute. Retinitis Pigmentosa (RP) is an inherited disorder that affects the light-sensitive cells in the eyes, called the photoreceptors. The photoreceptors are made up of rods and cones. The rods are the cells that are most sensitive to dim light and, therefore, are the primary victim of RP. Cones are responsible for color and central fine-detail vision and are affected secondarily. RP can be caused by a number of disorders. Different genes may cause different degrees of vision loss and the onset and severity can vary as well. Most patients with RP will experience night vision loss as an initial symptom. They will struggle to see stars and will have trouble driving at night. The rods are responsible for this type of vision and because they are located in the periphery, a patient might eventually experience a loss of side vision altogether (“tunnel vision”). Patients might test 20/20 but they will be considered legally blind because of the degree to which their peripheral vision is compromised. Eventually the central vision might also deteriorate; the signs of central vision loss can be detected by your eye doctor and include retinal pigmentation with the appearance of “bone-spicule” deposits. This will occur when the arteries that carry oxygen to the retina narrow and the optic nerve – containing the cells that carry the signals to the brain – become pale. Other signs can be detected with more specific tests. For instance, the visual field test might show significant contraction and, when less than 20 degrees of the field remains, the patient is considered legally blind. The elctroretinogram (ERG) measures the electrical signal of the retinal cells in response to light; in advanced cases this reaction is suppressed or perhaps absent altogether. In patients with RP, an ERG will show a loss of the “scotpac signal” or the dark-adapted response of the retina. 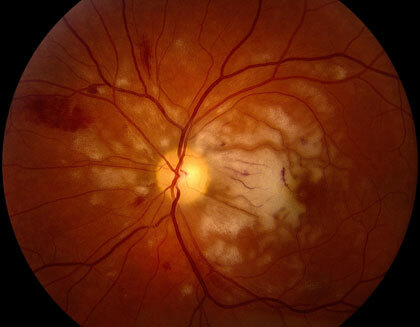 Other tests like Fluorescein Angiography and Optical Coherence Tomography can detect cell loss or “atrophy” found in RP patients, which might not have been spotted in a regular eye exam. Many patients with RP will develop cataracts, so your eye doctor should keep close watch for the symptoms. Other treatable problems, like Cystoid Macular Edema, might also be detected with these advanced tests. Recently, genetic testing for some forms of RP has been made possible; while the tests are currently used for diagnosis, they may ultimately be useful for treatment, as well. While there is no cure for RP, there are treatments that can help slow vision loss. Dicosahexaenoic Acid (DHA) and the retinal palmitate form of vitamin A have both been shown to slow visional field loss. Diets enriched in Omega 3 fatty acids have also been shown to slow vision loss. Vitamin E, however, – in doses of 400 IU – has been found to accelerate the progression of RP. If started by the age of 30 and, with the appropriate vitamin regimen and diet, a patient can add as many as 20 years of functional vision to their lives. While there are no reported instances of toxicity in healthy adults taking 15,000 IU of vitamin A palmitate daily, people are advised to have a liver function test completed and their vitamin A blood levels measured before they begin the regimen. These tests should be revisited annually, thereafter. Also, because of the potential for birth defects, women who are pregnant or planning to become pregnant are not advised to take vitamin A palmitate in this dosage. Bone density in women may also be an issue. For patients with CME, anti-inflammatory drops/injections and a diuretic, called Acetazolamide, may be effective. 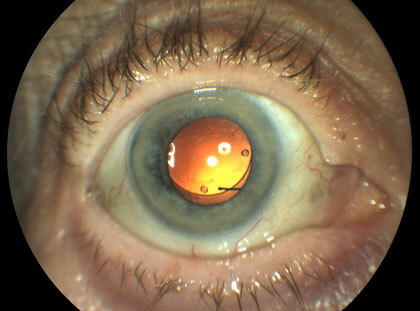 PSC cataract is amenable to surgery. Clinical trials with stem cells and growth factor replacement are currently underway and the specialists at RMI have helped pioneer some of the treatments. We keep our patients up-to-date about the latest trials and treatment options, so to help them maximize their visual potential.